Nothing dramatizes the continued silencing, burial and incarceration of Robert Mangaliso Sobukwe like the recent article by the esteemed University of Cape Town Professor, Xolela Mangcu. The article, titled ‘Imagining Our Institutions As They Should Be’, was meant to be a treatise on educational institutions in South Africa, but turned out to be a fine exposition of the dishonesty of South African Black intellectuals and their complicity in the construction of false histories. In his article Professor Xolela Mangcu continues the tired liberal footnoting of Mangaliso Sobukwe with former President Nelson Mandela. And he does so unashamed while spewing lies about and exposing his very little knowledge of Sobukwe. In a posture meant to undermine Sobukwe, Professor Mangcu writes that: “Nelson Mandela went to Wits University to become a successful lawyer, but he emerged out of that experience a great leader. Sobukwe too thought he might be a lawyer someday, but history had different plans”. Our interest is not so much on the fact that Mangcu makes the nauseating comparison of Sobukwe with Mandela, but more on the fact that in so doing, he belittles Sobukwe and omits his great intellectual accomplishments. According to Professor Xolela Mangcu’s footnoting exercise, Sobukwe merely “thought he might be a lawyer someday”. But apparently, “history had different plans”. But what “different plans” is Professor Mangcu referring to here really? It is beyond me how a university Professor, who is also a trustee of an institution associated with Sobukwe, the Robert Mangaliso Sobukwe Trust (RMST), could make such lose insalubrious public statements about Sobukwe. The truth of the matter is that Mangaliso Sobukwe not only completed his law degree while bannished under house arrest in Galeshwe, but he also completed his articles in Galeshwe, and established his own law firm there in 1975. History records that the racist apartheid government initially denied Sobukwe permission to enter the courts; however they reversed the decision and withdrew the prohibition after the government relaxed a clause that banned him from entering a court of law except as an accused or as a witness. However, no newspapers in the country were allowed to quote him when he argued in court. 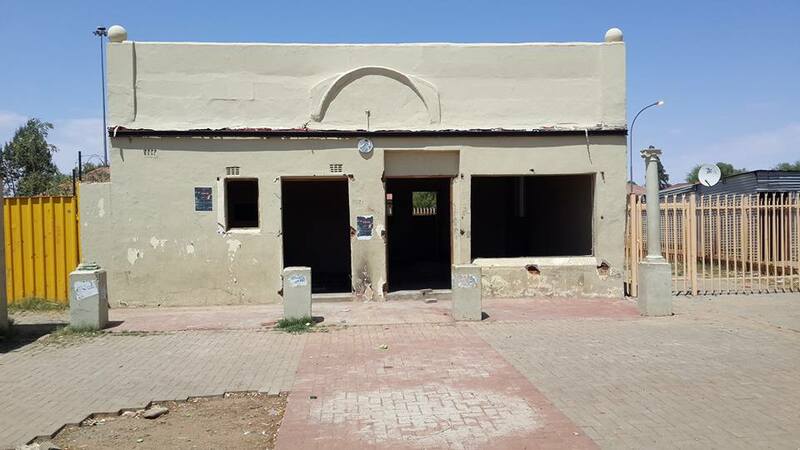 The offices of Sobukwe’s law firm – declared a national heritage site by the government in 2005 – are today an indictment on the conscience of South Africa as they lie abandoned, rejected just like him. But this is not the only Sobukwe-related institution that is in ruins. His houses in Mofolo, Galeshwe and Standerton are also in tatters, marking his lowly place in South African national consciousness. A little known fact is that in 1970 Mangaliso Sobukwe successfully applied for a teaching post at the University of Wisconsin in the United States of America, but the racist regime refused his request for a passport fearing the influence he would have outside the country. Moreover, Sobukwe subsequently applied to leave South Africa permanently with his family in 1971; an application that was also systematically refused by the white settler regime. Sadly, as today marks the 39th anniversary of his death, Sobukwe’s memory continues to languish in solitary confinement; Sobukwe’s personality, his intellectual work and his voice remain under house arrest. Subsequent Sobukwe Clauses on his legacy continue to be enacted and activated by intellectual misgivings of people like Professor Xolela Mangcu who bury his memory under Mandela footnotes. As such, his intellectual accomplishments, his life’s work, his immense intellectual and political contributions in the history of this country remain side-lined, unknown and obscured. Last year, 2016, after tedious submissions and recommendations by the Pan-Africanist Student Movement of Azania (PASMA), the Wits University Naming Committee announced that it had endorsed a proposal to rename its Central Block Building after Robert Sobukwe. Some of us welcome this move by Wits University with a pinch of salt as Sobukwe deserves more than a mere University building renamed after him. Since Sobukwe believed in the supreme value of education, a more befitting honour to his memory would be the institution of a scholarship fund after his name, to train Afrikan students in areas of leadership for the 21st century. Now that Wits University has made this small gesture, we hope that Professor Sakhela Buhlungu, the newly appointed Vice Chancellor and Rector of the University of Fort Hare, will also heed to the proposals and calls for the renaming of that institution to Robert Mangaliso Sobukwe University. After 100 years of being named and called after a colonial criminal – Colonel John Hare – responsible for the massacre of thousands of Afrikans in the Eastern Cape, the University of Fort Hare would do well to honour one of its greatest alumni. Regardless of the uncanny manoeuvres of his enemies and those who deem him a Mandela footnote, Mangaliso Sobukwe refuses to die, his intellectual prowess remains supreme, and his revolutionary memory and zeal persists in the minds of new generations. Sobukwe remains one unparalleled leader; yet, a lone towering figure in the history of Azania.